UNHCR, the UN Refugee Agency, together with 30 humanitarian partners, has launched an appeal for US$504 million to assist the people forced to flee one of the world’s most complex, challenging and forgotten crises in the Democratic Republic of the Congo (DRC). By the end of the year, it is estimated that the number of Congolese refugees in the region will reach close to 800,000. The 2018 DRC Regional Refugee Response Plan (Regional RRP) aims to address the challenges and gaps in supporting these refugees and their host communities, in seven neighbouring states, as well as countries in Southern Africa. “Unless we act swiftly to avert a slide in standards and conditions, the impact will be disastrous on the already precarious humanitarian situation of the Congolese in the region,” warned Ann Encontre, UNHCR’s Regional Refugee Coordinator for the DRC situation. Since the start of 2017, over 160,000 Congolese have been forcibly displaced across Africa, due to widespread militia activities, unrest and violence in the DRC – a country almost the size of Western Europe. Reaching in total 740,000, the Congolese refugee population is one of the ten largest in the world. Nearly 55 per cent are children, many crossing borders unaccompanied or separated. The funding appeal will focus on the immediate emergency response in Uganda, Zambia and Angola, while preparing for a larger influx in the Republic of Congo, Tanzania, Rwanda and Burundi. “Widespread support, adequate resources and collaboration are urgently required to avoid more suffering or even loss of life. Now, more than ever, we need to renew our solidarity with the Congolese refugees,” added Encontre. Existing camps and sites are saturated, and available basic services are stretched to the limit. The situation adversely affects the most vulnerable, like the numerous women who have been subjected to sexual and gender based violence before and during their flight. In many hosting areas, the refugees have to be relocated to safe spaces, away from the borders. Considerable investment is also needed for new and established settlements, in order to ensure that the Congolese can benefit from adequate medical care, food security, effective water systems and quality education. The pressure is markedly high on areas already welcoming large refugee populations. Uganda, for example, has received over 61,000 Congolese in 2018 due to a recent flare-up in violence at DRC’s North Kivu and Ituri provinces – with a significant social, economic and environmental impact. Meanwhile, other hosting countries currently experience their own complex social, political or economic crises, affecting different sectors and aspects of refugee protection and livelihoods. The 2018 Regional RRP will give priority to access to territory and refugee protection, response to immediate needs, and partnerships to achieve durable solutions for the Congolese refugees. 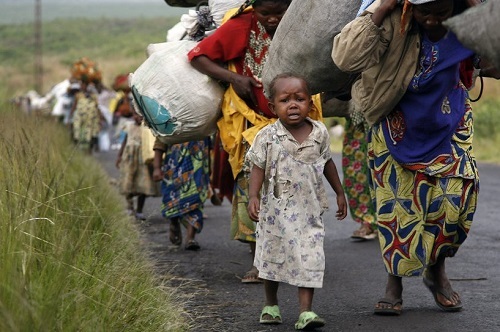 Inside the DRC, the crisis has led to the internal displacement of 4.5 million people.